Café Terrace at Night – Lost in Translation? 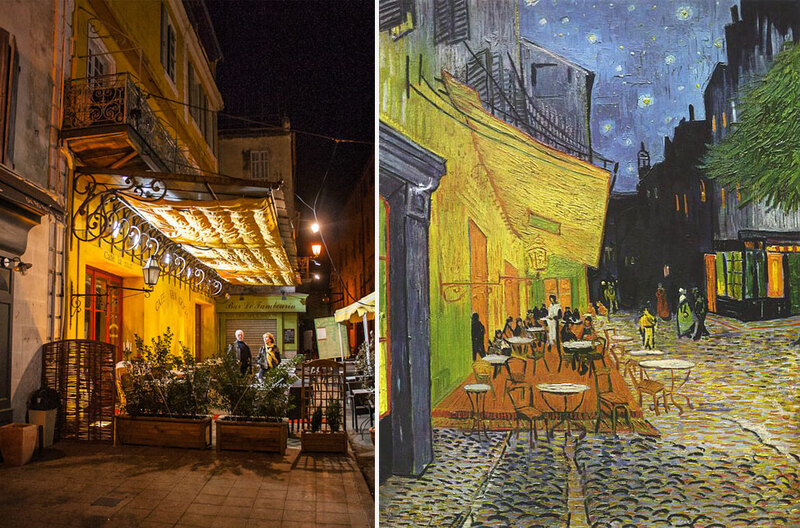 Café Van Gogh, Arles, France in 2007 (left), and Van Gogh’s painting ‘Café Terrace at Night’, 1888. I was looking for the original title of Vincent Van Gogh’s painting Café Terrace at Night (above right), because I wanted to upload my photo (above left) of the same scene to my profile on the 500px.com website. I try not to leave the ‘description’ field completely empty when I publish an image there, so I thought I’d check out the name of the café, the original name of the painting, and the English name of the painting. The way I see it, there is something of a distortion in the translation. The French name is Terrasse du Café le Soir, and by the time it’s in English, Café Terrace at Night, it’s a generic café terrace in the evening. The actual meaning of its French title is that it’s the terrace of a café called ‘Le Soir‘. At least that’s my interpretation; as I understand it, in French, a named café puts the word ‘Café’ before its name, for example, ‘Café le Baron‘ is a café called ‘The Baron’. So Café le Soir could be interpreted the same way. Please correct me if I’m completely wrong; I make no claim to actually being any good at French. So have I discovered, here, that when an English speaker looks at the painting and sees this title, they are being given misinformation? Is it really an incorrect translation that misleads us when we read into the meaning of the painting? I’m not sure. I’m not sure if the title actually matters. It’s a café with seats and tables in the street, and it’s in the evening. When people look at an image of any kind, they interpret it in their own way. The title of an image can have a very important impact on how we interpret both its content and meaning. At a very simple level, let’s imagine a red square being printed onto canvas and hung in three different art galleries. In each gallery it is given a different title: ‘Sauce’, ‘Blood’ and ‘Claret’. The audience at each gallery will probably perceive the painting in three very different ways. The source of the apparent difference in translation with the Café Terrace at Night may be that when it was originally put on display, it was titled Café, le soir, or Coffeehouse, in the evening. So perhaps the confusion is down to the lack of a comma?